Liberty USA Painting > Blog > Painting Blog > Cabinets: Don’t Toss Them–Refurbish Them! A kitchen overhaul is a huge, expensive, time-consuming undertaking, whether you are a DIY-er or prefer to hire a contractor. True, kitchen upgrades add considerable value to your home’s worth; however, if you aren’t in the market for gutting and rebuilding, refinishing your cabinets will definitely provide a kitchen face lift! Don’t toss your cabinets refurbish them! The process begins with removing the cabinet doors and hardware. 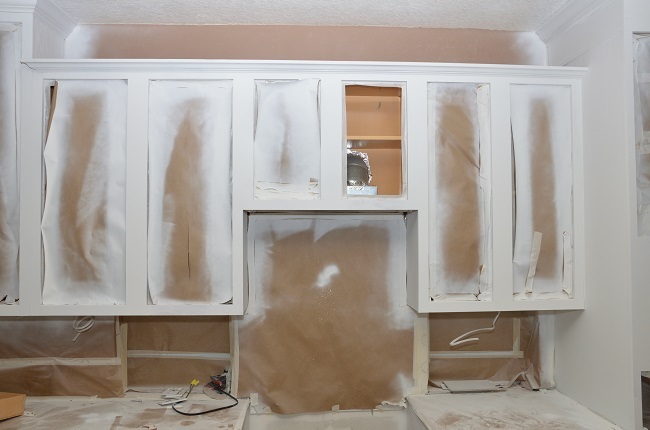 The cabinets are cleaned and sanded, and gaps are filled in with wood putty or spackle to ensure a smooth finish. A good primer will provide the foundation for your paint, and it may enable a single-coat coverage of your color of choice. Painting your cabinets is only one option, however. You may wish to enhance the wood’s natural grain with a new varnish. Again, removing the doors and hardware is step one; applying a stripping agent will help remove the old varnish, followed by a thorough cleaning with steel wool and mineral spirits. Once you’ve got a bare surface to work with, a polyurethane varnish in your color choice can be applied in layers until the desired hue is reached. Complete the revamp of your cabinets with new hardware. If you don’t wish to drill new holes or fill the existing holes from your old hardware, be sure to take an old handle with you when you go to pick out new ones. You’ll want to make sure your handles and hinges match. Putting in convenient sliding drawers while your doors are removed and you have easier access to cabinet interiors. Reviving your kitchen can be a daunting task, but Liberty USA Painting is here to help you with the process! If you are considering a kitchen painting project, we ask you to contact us for an estimate. You will see the difference our commitment and professionalism makes!